When it comes to children, school holidays can be hard work – some more than others. 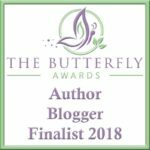 I find October and February half term the most difficult in terms of entertaining the children with the weather often wet and cold, and limited ideas on how to keep them occupied when you’re cooped up in doors. 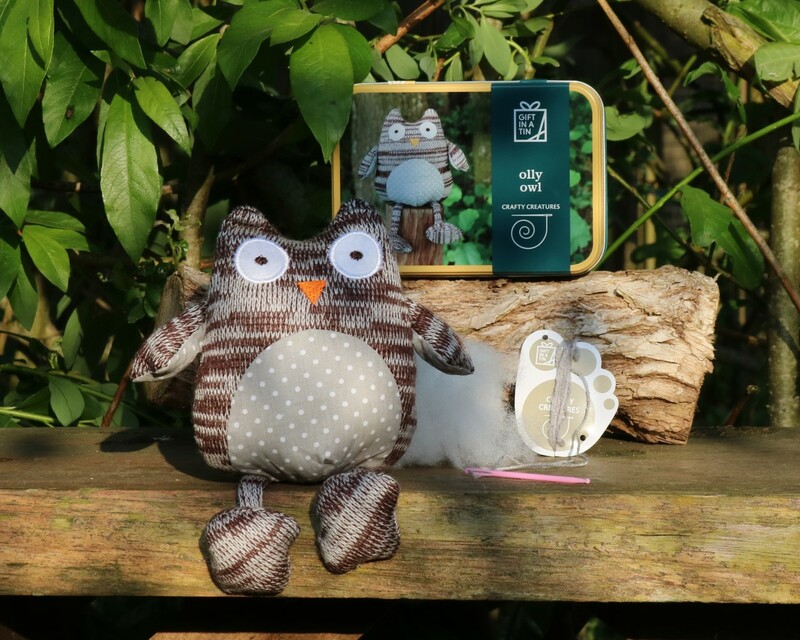 This half term Present Mill have launched Half Term Craft Club where they have a fantastic range of crafts to share with your children to keep them entertained. We have been enjoying the Gift in a Tin range which is quite simply, a gift in a tin. 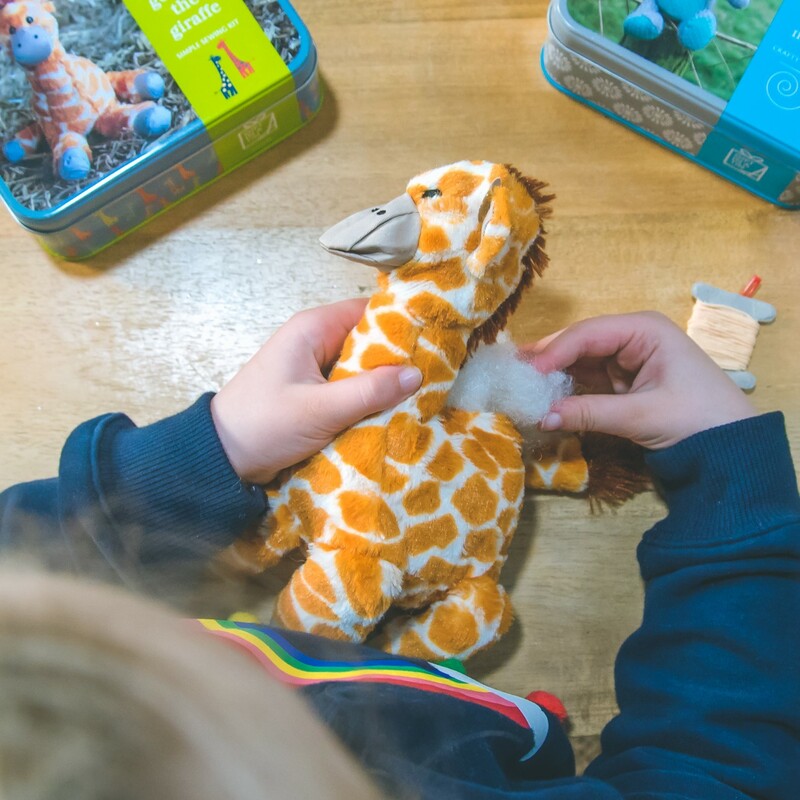 With a fantastic range of animals and figures, some requiring sewing and others requiring gluing and sticking, there is something for every child whatever their age, interests, or ability. The great thing about these sets is that they include everything you need to make the finished product, so there’s no rushing out to buy emergency crafting materials, or getting half way through and realising it’s going to cost you the earth to finish. It’s just one price, everything you need, and full instructions which, if you aren’t crafty minded like me, is always a bonus! The girls couldn’t wait to get stuck in over half term and Eva chose to make this gorgeous giraffe which is lovely and soft and perfectly sized for little hands. 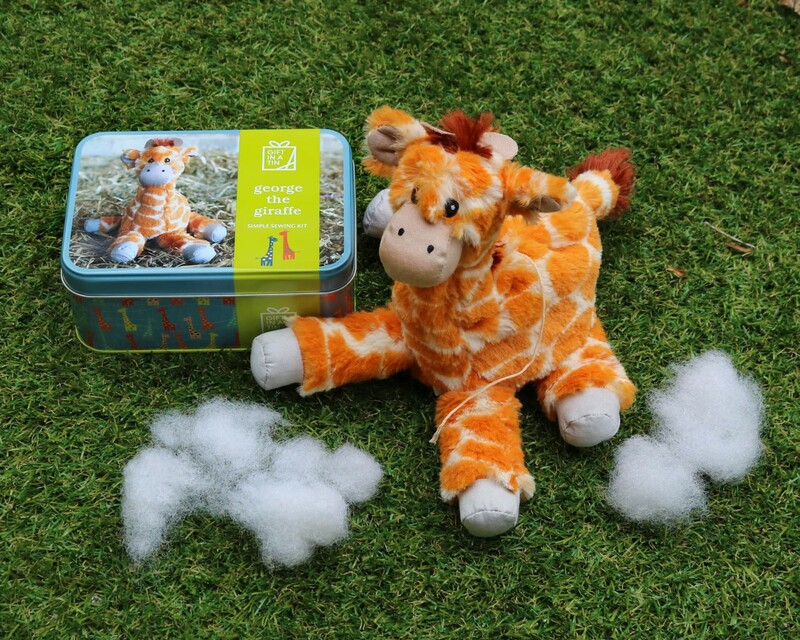 Once you have filled the giraffe with the stuffing provided you simply need to stitch up the small opening at the back and you’re done! The set comes with a plastic needle and thread, so no sharp points, and Eva managed to stitch it up in no time with a little help from myself helping her to finish off and cut the thread. I think Half Term Craft Club is such a fun idea and one my kids will really get on board with. Present Mill are offering one lucky winner the chance to win the adorable Milly Mouse with an RRP of £11.99. To enter simply follow the link below and one lucky winner will be chosen at random and notified via email at close of giveaway on March 31st – Good luck! I think these sets look great. Lovely gift. Great introduction to crafting, and would be treasured by child. It’s a lovely idea and the toys look so cute when made.Children will really enjoy making them and have a lovely toy at the end too.I can see children taking them to bed with them just like i used to.It teaches them too on how toys are made. I think these sets are a brilliant idea. You can see what the finished item will look like, all the materials are included and there’s a nice tin to keep too. My niece is very into crafting and would absolutely love one. I think these sets are lovely and a perfect gift idea, My daughter received a sock monkey just before Christmas and really enjoyed putting him together, Brilliant activity to do together and a nice change from gaming! They look really good, the kids will would enjoy making them with a little help. These sets look great and something to keep the children away from playing video games for a few hours. I think that they are really good, and will get the kids interested in making. they are so sweet- I particularly love Milly Mouse! I absolutely love these sets and would make a lovely gift. I think they aregreat and I can imagine my daughter loving them. Great idea. Kids should be doing more crafty activities rather than being on computers. They are lovely! I would like them for myself! I think they are lovely. Milly mouse is the best one. they are so cute! how lovely! Seriously cute. It’s good for older children to get creative and have fun. They’re very sweet & would be fun to do together! Such lovely gifts to give or receive. Great to help teach a skill for children too. I love these kits, especially Milly Mouse and Olly Owl. They are perfect for getting youngsters into sewing. Such a lovely gift idea for children. So cute and something you could do with your child together. So cute…a lovely friend that children can make from scratch and be a friend forever. 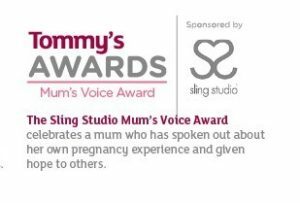 these look like a great way to do things together with my daughter, and both learn something as well!! I think these are really good for young people. We are all sewers in my house so this would be perfect to get my granddaughter into sewing too. So sweet. I want them all! They look great fun and not too tricky and the mouse is my favourite! I think they are so cute, would make a lovely present . They look like a lot of fun! Thanks for the competition. 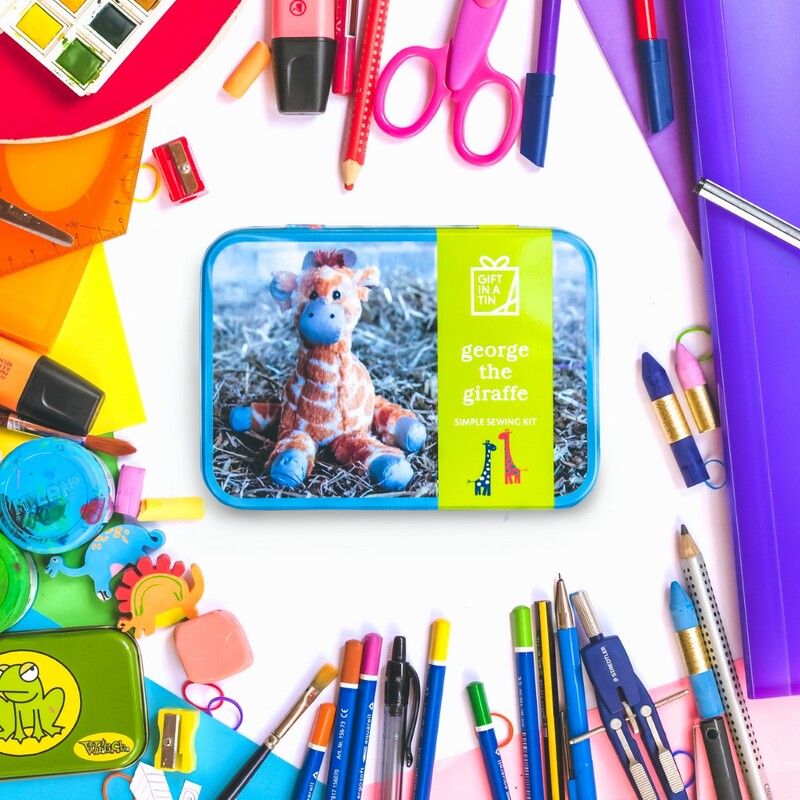 Lovely sets to encourage young crafters – love that the tin safely contains everything you need and the finished product is so cute. I think these are so cute and something the kids would enjoy. These look wonderful & I’d love to do them with my Granddaughter. I think they are lovely. I would have loved one of these as a child and my granddaughter would be thrilled. 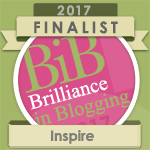 Such a good idea – i’d like to do one myself! 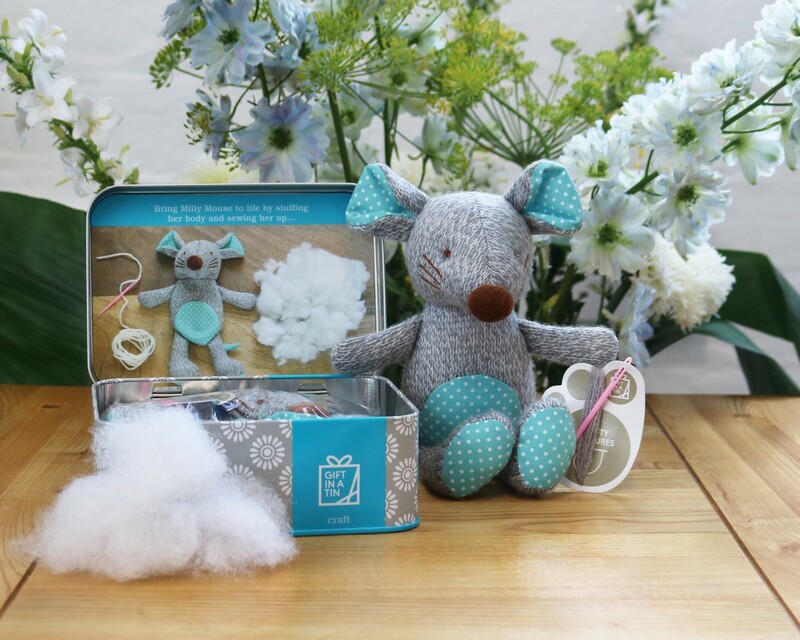 These kits are great to encourage a love of needlework for children. I think that these are lovely and the children will be able to make a really worth while item which they can be proud of. 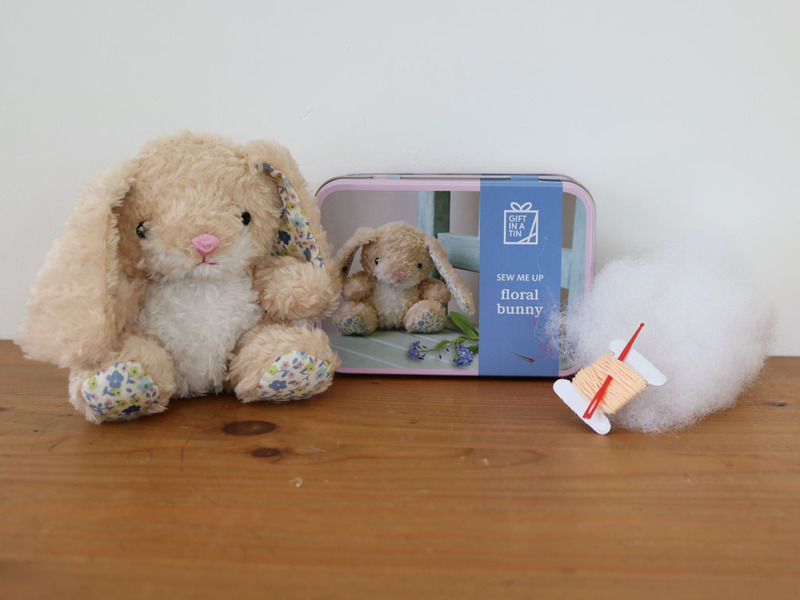 They are so cute, and children will learn sewing from them, and also have a lovely item to play with afterwards. I remember sewing a rag doll when I was younger and got annoyed in parts but when I had finished her she was definitely worth all the effort. She’s still sat on my bookshelf today. These are all so cute it isn’t true! I have to say though that the mouse and hedgehog do warm my heart just a little bit!! 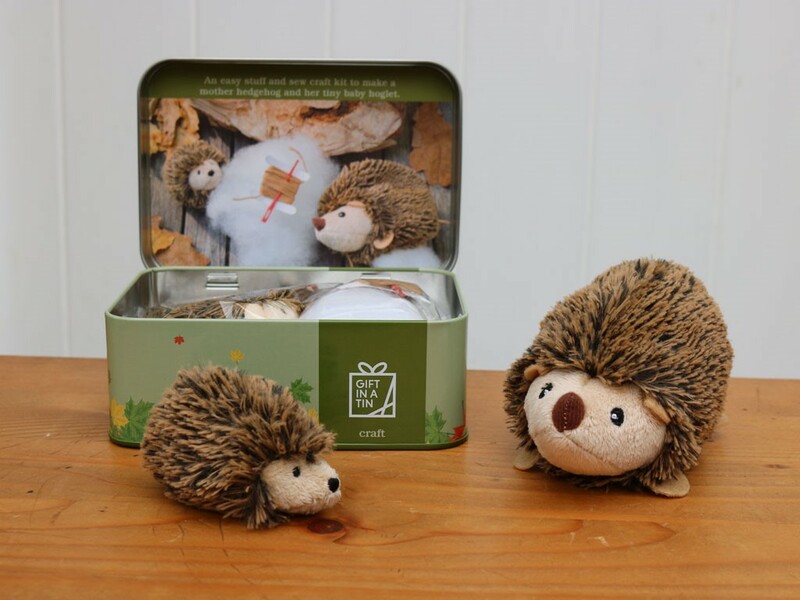 These are absolutely gorgeous, Especially the hedgehog! What a clever idea to get children interested.